After the opening day's cold and grey conditions, the sun made a welcome appearance on day two of the Vice Admiral's Cup in Cowes. It was joined by a lovely northwesterly breeze which kicked off the day in the high teens with guests up towards 25 knots, and gradually dropped to around 10 to 12 knots for the later races. The sparkling conditions enabled the Royal Ocean Racing Club's Race Committee to run four more windward leeward races making the total number sailed so far seven and bringing the discard into play. The first race of the day, race four in the series, was the windiest and there were plenty of thrills and spills to entertain the spectators, particularly amongst the notoriously tippy Quarter Tonners and the slippery little SB20s. Although several boats did spin out there were no serious incidents and everyone made the most of the stunning conditions. For the most part the fleets were very well behaved on the start line with just a few individual recalls, although the J/109s did blot their copybook in race five by forcing a general recall. Fortunately the race committee had them turned round again within minutes and they were all clear at the second time of asking. 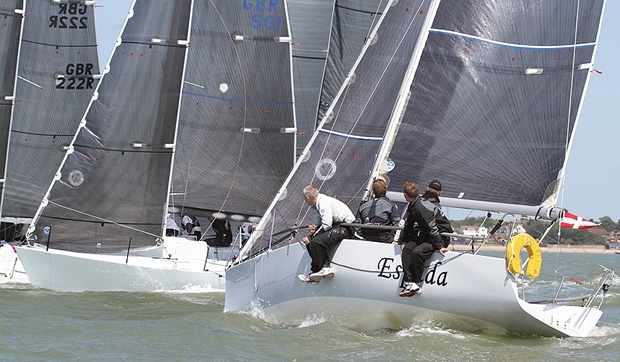 The Quarter Ton class continued to see incredibly close racing. Although they scored a seventh in race five, Sam Laidlaw and his crew aboard Aguila were able to discard that result and add two further firsts and a second to their overall score, giving them a total of nine points to count and a six point lead. Tony Hayward's Blackfun was in exceptional form and put in a 4, 1, 1, 3 score for the day, putting them on equal points with Rickard Melander's Alice II. Both boats count fifteen points with Blackfun currently claiming second on count-back. Louise Morton's Bullit, being helmed today in Louise's absence by Collette Richmond, also had a good day pulling up from fifth overall to fourth at the expense of Richard Fleck's Per Elisa, with whom she swopped places. The J/111s continued to be dominated by Tony Mack's McFly who faltered only briefly in race four with a second, but then went on to win three straight races giving them a six point margin over their nearest rival. Stuart Sawyer's Black Dog was the boat that got the better of McFly in race four and they went on to add a neatly sequential second, third and fourth to their card giving them 13 points overall. Black Dog now lies second overall and has a comfortable 12 point cushion, but the battle for third place is going to be a close one with Mustigo, owned by Scholefield/McDonald/Thomas just a single point ahead of both Icarus, owned by Andrew Christie & Chris Body, and JElvis, owned by Martin Dent, who both count 26 points going into the final day. In the SB20 class Forelle Estates, owned by the Llewellyn/Wakefield/Virgus partnership, is giving a masterclass in sports boat sailing and is in the enviable position of discarding a first place to lead the regatta with six points, eight clear of the chasing pack. Leading that pack by a two point margin is Charles Sheppard's Sharc on 14 points with eDigital Research, owned by the Russell/Westlake partnership, still in close contention in third. The J/109 class saw the fiercest battles of the day with three different winners of the four races. By far the most consistent performer with a 1, 3, 1, 2 score was Ian Nagle's Jelly Baby who continues to lead the class and has extended their margin to 13 points. Yesterday's second place Jolly Jack Tar, owned by the Royal Naval Sailing Association, did not find the winder conditions to her liking and dropped down from second to fourth place. Leapfrogging over her was Robert Stiles Diamond Jem, which won race five and is now on equal points with Paul Griffith's Jagerbomb, which continues to hold third place on count back. Both boats are counting 21 points and discarding a seventh place. In fact just four points separate second to sixth place in the J/109s with Tony Dickin's Jubilee fifth with 23 points and David Rolfe's Shadowfax, winner of race seven, sixth overall on 25 points. Tomorrow's final day is going to be an exciting one for the J/109s. After racing a delighted Robert Stiles of second placed J/109 Diamond Jem commented: "It was fantastic sailing today. Good wind and the race officer did terribly well in keeping the races rolling. We're very glad we got four races in. We're an all amateur crew of weekend sailors from Brighton Yacht Club and we've come up to the Solent for this event which gives great class racing for us. Neil Angel is our tactician and his experience as a past winner of Cowes Week in the 1720s is invaluable. It's all to play for and as always seconds count and it will no doubt be like that tomorrow. It is the most challenging racing and the whole crew enjoys the sheer excitement that the J/109 class always generates." With huge potential for gains and losses for in tomorrow's concluding races we can expect a great finale. The forecast promises a south westerly that will be light and unstable first thing, but should then stabilise and build to the mid teens with gusts up into the low twenties. Weather permitting Race Officer Rob Lamb aims to run two final races starting at 10.30 to conclude what has already been a great regatta.